Each day I write one page of a stream of consciousness in my journal. A few days ago I hit day #190. No small feat and one I’m incredibly proud of. After feeling like journalling was never going to be my thing, i finally hit some consistency last 2018 after months of a commit/forget/fail/recommit cycle. The rules I follow are simple. 1 page. Tugging on a thought or some meaning or just a feeling I had that day. I try to avoid a ‘today i did this’ and prefer to explore ideas. On the opposite page, i leave open to the day. Quotes, diagrams, thoughts, to-do’s anything that I feel will be a value add to future Wallace, or anyone who may happen upon the pages. 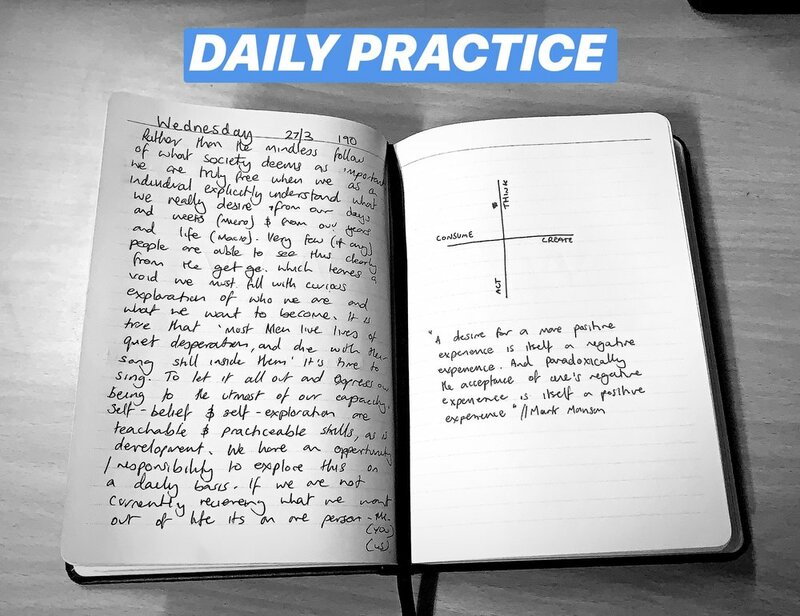 If you’re not currently journalling and think it could help you (It’s changed my life for the better) touch base and I’ll help you get started with your own practice. Here is my entry from Wednesday 27/3/19 word for word. No edits. Theres something about writing fast and wrong and putting the unabridged thoughts straight onto paper. The thought string I pulled on was sparked by the book I’m currently reading ‘Fooled by Randomness’ Nassim Nicholas Taleb. Rather than the mindless follow of what society deems as ‘important’ we are truly free when we as an individual explicitly understand what we really desire from our days and weeks (micro) and from our years and life (macro). Very few (if any) people are able to see this clearly from the get go. Which leaves a void we must fill with curious exploration of who we are and what we want to become. It is true that ‘Most men live lives of quiet desperation, and die with the song still inside them’. It’s time to sing. To let it all out and express our being to the utmost of our capacity. Self-belief and self-exploration are teachable and practiceable skills, as is development. We have an opportunity / responsibility to explore this on a daily basis. If we are not currently receiving what we want out of life it’s on one person. Me / You / Us. If you resonate and enjoy the idea, let me know.